Could social media and smartphones have prevented one of Shakespeare’s greatest tragedies? 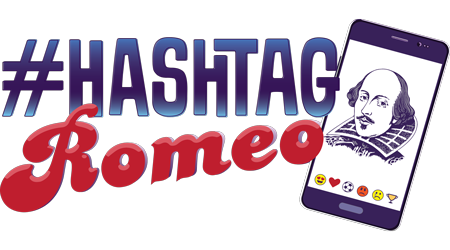 From the best-selling playwright of Alice@Wonderland, Jonathan Yukich’s Hashtag Romeo embraces the spirit of Shakespeare in a modern high school setting... complete with famous lines from the original but without all the tragedy! In this contemporary and comedic retelling of the Bard’s classic Romeo and Juliet, two Verona (Wisconsin, that is) high schools bear an ancient grudge, set to be conveniently settled at the city’s championship soccer match between the Montagues and the Capulets. Read more...But an off-field spat causes the game to be cancelled, and when Montague’s star striker, Romeo, is later caught sneaking into the Capulet dance — where he secretly falls in love with head cheerleader, Juliet — temperamental Ty vows to settle the score. Chalupas are consumed. Tires are slashed. And Ty challenges Romeo to a fight. Just when tensions threaten to tear the whole school district apart, the star-crossed couple comes up with a plan to stage a protest for peace and livestream it on social media, in hopes that true love (and Twitter) can bring the two sides together. This comprehensive DVD moves through Shakespearean text with a highly physical series of exercises .